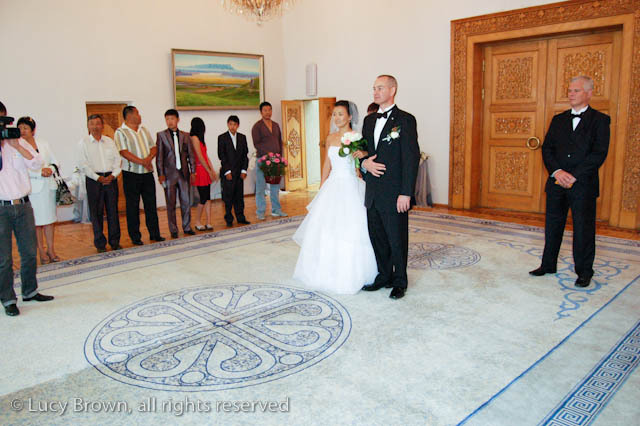 When we entered the Wedding Palace I had no idea that there would be two ceremonies. 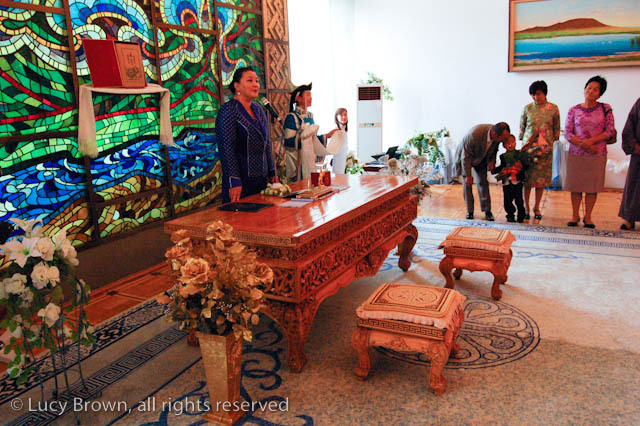 Firstly the official tying of the knot, plush western registry office style, then a traditional Mongolian ceremony. The only foreigners at the wedding except for my brothers and me. Anja (left), a Cirque du Soleil performer, flew in from Las Vegas. Mark, Kerry and Andy are all friends from England. Inside the Wedding Palace just before the ceremony starts. 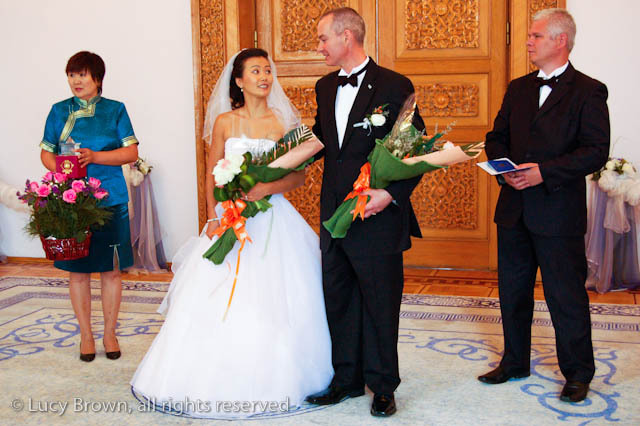 Listening to their vows in Mongolian which Anna translated to Mike. A few words directed at Mike were in English but the lady’s accent was so thick it was hard to recognize she was speaking English. I understood only a few words from the ceremony. 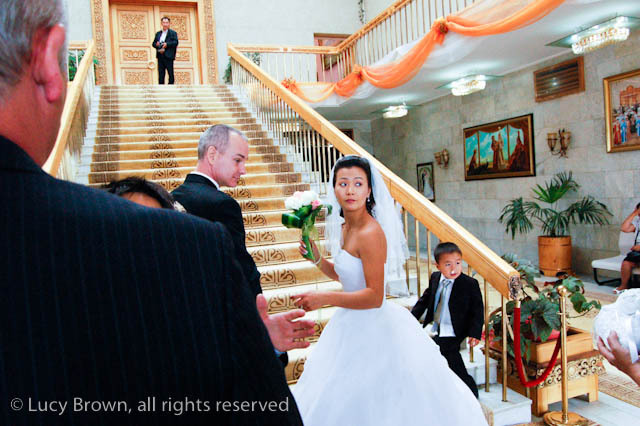 The bride’s family and friends stood on one side of the room and the groom’s on the other. As there were so few of us on Mike’s side, some of Anna’s family and friends stood with us. 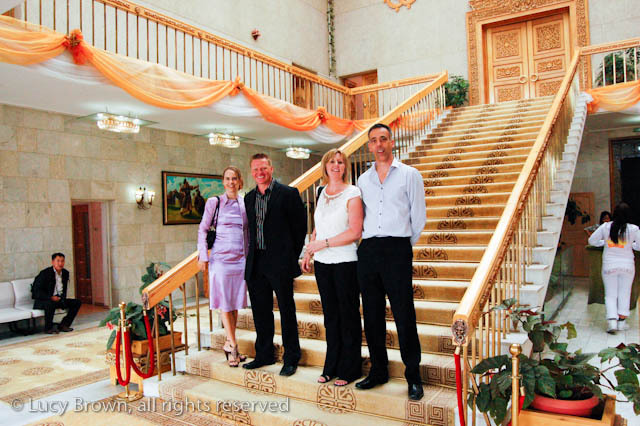 Not many could make the long trip from England and Las Vegas to Mongolia. Matt my older brother and best man stands on the far right. Mike putting on Anna’s wedding ring. Anna has two wedding rings. 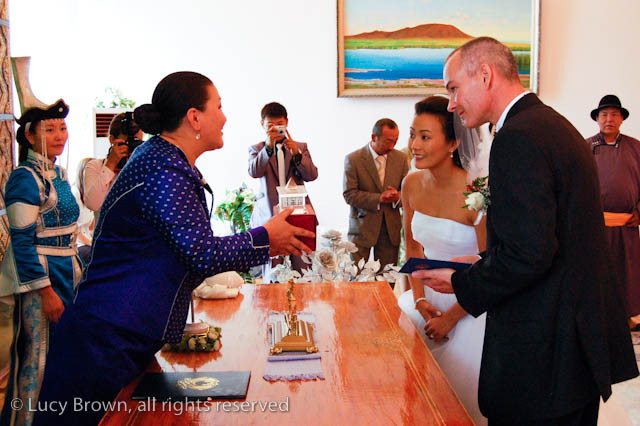 On her left hand is the western style ring and on her right hand a traditional Mongolian ring. Her parents presented both of them with rings on the morning of their wedding. Anna’s has the female symbol and Mike’s the male symbol. Anna putting on Mike’s wedding ring. 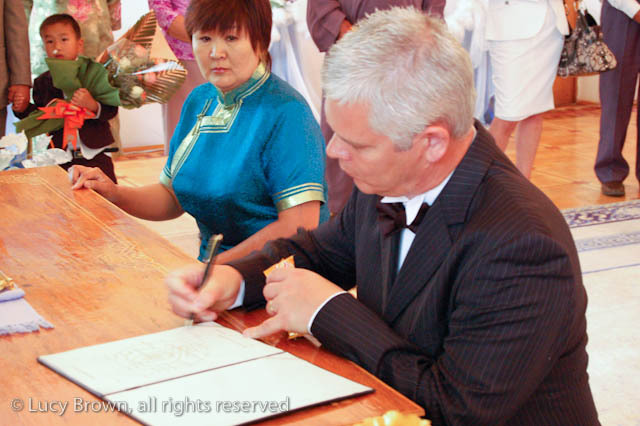 Matt my older brother and the best man signing the register. The matron of honor was Anna’s aunt. The registrar presents the couple with their wedding certificate and a replica of the Wedding Palace. 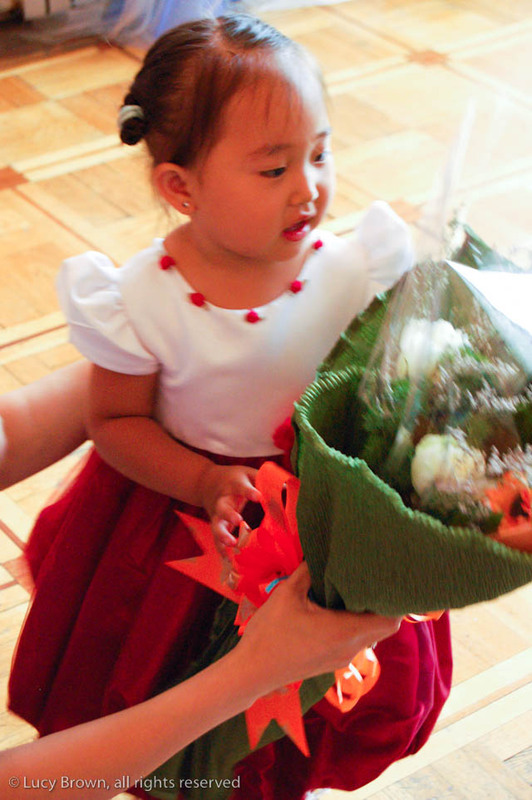 After family and friends had presented them with bouquets of flowers. The knot is tied and the ceremony is complete. This entry was posted on October 30, 2010 by loca4motion. 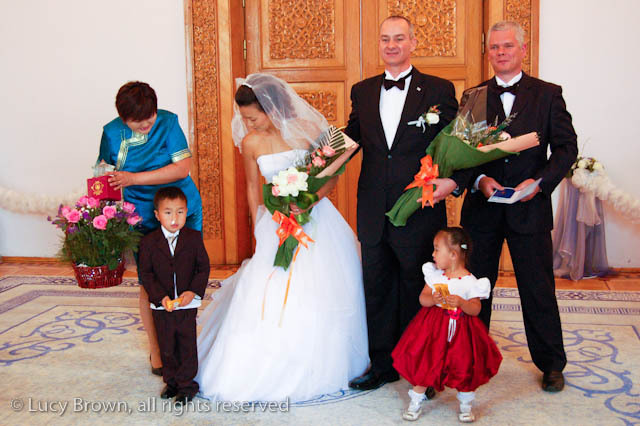 It was filed under Asia, Mongolia and was tagged with culture, mongolia, mongolian wedding, photography, traditions, travel, ulaanbaatar, wedding, wedding ceremony, wedding palace.